We saw two back to back allins on two adjacent tables just prior to the break. 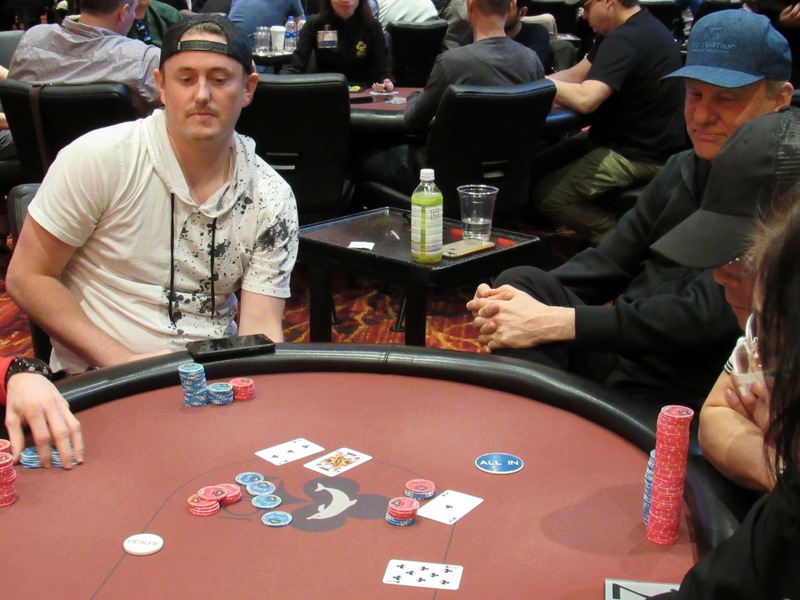 In the first hand, Andy Seth called a small all in on a [9d][2c][Jd] flop holding [Ac][Qs]. He was live against his opponent's [9h][7d], but the [7c] on the turn quickly changed that. Andy shipped 115,000 to his opponent and now sits on around 130,000. In the next hand, Taylor Paur moved all in from the small blind and the big blind called off his 31,000 chips with [Ac][8c]. Taylor was live with his [Jd][3c] but the board ran out [Td][9d][As][Tc][Jc] to give Taylor's opponent the winning two-pair. Taylor jokingly put his jack next to the river card before paying off his opponent. Taylor now sits on just under 100,000.